Last month’s column focused on GIGO. Historically, GIGO meant Garbage In Garbage Out. Today, widespread application of computers has morphed GIGO into Garbage In Gospel Out. The lack of good data or the insertion of wrong data into virtual metalforming codes causes even the best codes to produce wrong answers. When the computer indicates the virtual forming process is well designed with an appropriate safety margin and then the physical part drastically fails, all virtual metalforming codes receive a bad name. However, the code is not at fault because it designed the forming operation to make a virtual part with the data the operator entered into the code. If the physical press shop uses material with properties, lubricant or other parameters different from the virtual press shop, why would one expect a successful outcome? Unfortunately, most press shops do not have the capability to utilize the tremendous benefits of virtual press shops. Therefore, most press shops do not have to worry about GIGO. Wrong thinking. Many routine procedures in a normal physical press shop are vulnerable to lack of good data or misunderstanding of basic sheetmetal processes. Wrong thinking leads to bad parts out. Almost every sheetmetal stamping has some form of sheared edge. Examples include cut blanks, trimmed stampings, punched holes, cutouts, lances and notches. Look at your sheared edge. Nice and clean, no rollover, few very minor burrs, 40-percent burnish/60-percent break, very little shear damage. Why does that sheared edge tear at low strain levels when subjected to tension? While one assumes that a normal-looking sheared edge has suffered little damage, data has proven differently. A classic test was performed by Bob Hilsen of Inland Steel (See graph). 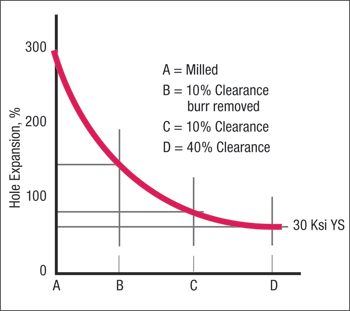 The traditional 10-percent shear clearance produced a hole expansion of 80 percent. Cleaning off any burrs and squaring the edge increased available hole expansion to about 140 percent. When a milled hole was tested, a hole expansion of 280 percent was achieved. If one assumes very little cold worked damage to the sheared edge, then any edge expansion beyond 100 percent will generate edge cracks that can grow to substantial lengths. This is only one example of hole expansion data. The exact amounts of edge stretch will be determined by the shape of the punch, the quality of the punching tool, lubrication, forming speed, sheetmetal composition and micro-structure, and other specific test parameters. With standardized test parameters, comparison data shown in the graph can be very useful and educational. Another potential problem area is friction. In high school, or now even earlier, the teacher demonstrates measurement of the coefficient of friction (COF) by hooking a spring scale to the end of a weight and pulling it across a surface to be measured. The COF is the pulling load divided by the normal force (weight of the block) on the interface. This computation says the COF is independent of the contact area between the sheet and the weight. Friction studies about a decade ago showed the COF changed with contact area. The sheetmetal has a rough topography characterized by a series of peaks and valleys. As the material deforms over the die, the amount of contact area increases as the peaks break off or are bent. The measured COF increases with increasing deformation. Therefore, the laboratory measurements typically represent only the undeformed material. Even worse, the studies showed that the contact area and therefore the COF changed with location in the stamping due to the amount of deformation, the local rate of deformation, the interface pressure, the quantity of residual lubricant, the heating of the lubricant and other factors. In summary, one does not know the instantaneous COF at any location within the stamping with any degree of accuracy. Putting any single number into the virtual metalforming code is a classic case of GIGO. There is one exception, however. The newer dry (barrier) lubricants use polymer or other coatings to physically separate the workpiece from the die. Now the COF is determined by the interfacial shearing within the lubricant. Even better, most of these dry lubricants are temperature insensitive. Now a specific COF can be entered into the code for more accurate prediction of final virtual forming. These lubricants also mean that physical press shops will produce more dimensionally stable stampings to meet the more rigid dimensional specifications imposed by their customers. Another troublesome forming problem is attempting to switch between steel and aluminum in the same die—even if both materials have the same yield strengths. First, the aluminum will have three times the springback of steel because the Young’s Modulus of aluminum is one-third that of steel. Second, steel has a positive strain-rate hardening exponent. The more quickly steel is deformed, the higher the flow stress becomes during forming. In contrast, many aluminum alloys and other nonferrous alloys have a negative strain-rate hardening exponent. The faster the metals are deformed, the lower the flow stress becomes. This change in strain-rate hardening greatly affects the distribution of strain and severity of strain gradients throughout the stamping. Making these substitutions not only requires good data but a much deeper understanding of sheetmetal deformation.